The mustache theme is very popular in parties right now, and it’s no wonder—they are marvelously fun, and decor is easy since you can slap a mustache on just about anything to make it festive. I recently had the privilege of hosting a mustache baby shower for my friend’s second child, and the mama-to-be was thrilled to have her very own mustache party to celebrate. The mustache decor was very simple and consisted of some cute printable signs, a few pieces of bunting and some darling pictures of babies…with mustaches! 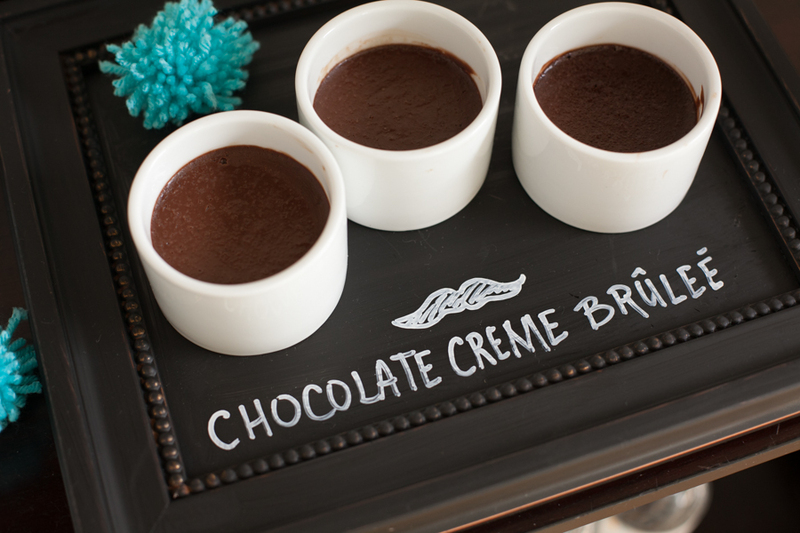 Every party has to have one really “wow” item (it’s what the guests will remember most! ), and for this baby shower it was the food. With the time I had left from not crafting a million decorations, I was delighted to be able to make some really fabulous food for the shower. There were lots of homemade sweet and savory bites to go around—chocolate creme brûlée, a chocolate ganache and toffee cake, chocolate cupcakes, strawberries with balsamic vinaigrette, basil and goat cheese, wasabi vegetable crab rolls, hot ham and swiss marinated rolls and bacon wrapped stuffed dates among other mouth watering appetizers. Tucked in among the baby pictures was a (doctored) photo of the new baby’s big sister from when she was tiny. Our flower arrangements from Buds, Etc. also got the mustache treatment! Several frames were painted with chalkboard paint with messages to our guests written on them. 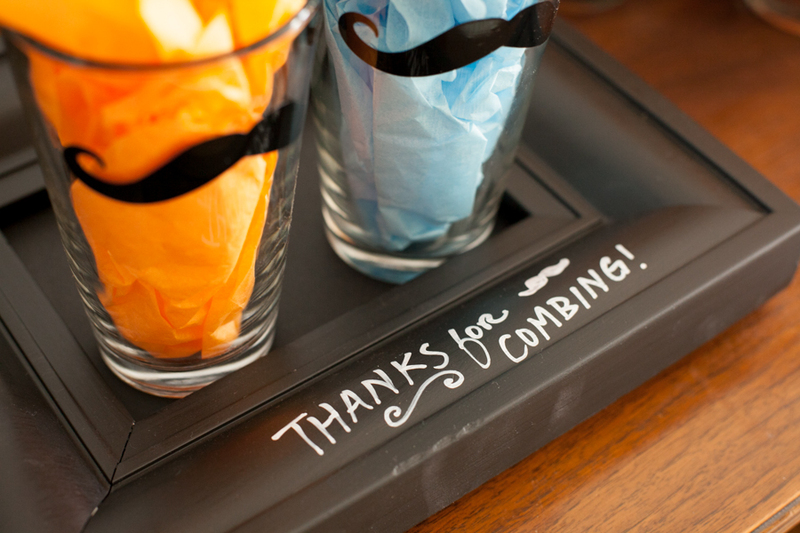 They were one of my favorite touches, along with the mustached pint glasses we gave as party favors. 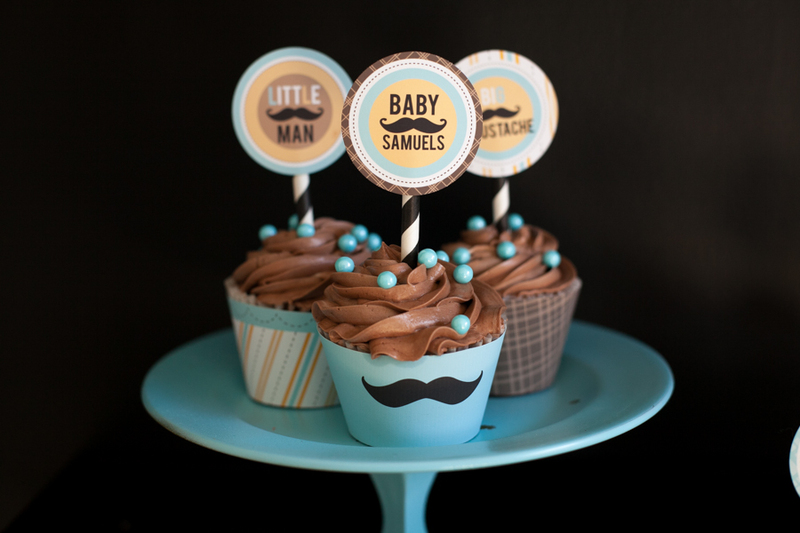 Mustache themes work as well for birthdays as they do baby showers—little men, big mustaches for newborns or ten-year-olds—it’s hard not to be a winner with this adorable theme! I love the food presentation and the little details. I particularly like the little table with ladder shelves on the sides. Yes, that’s true, mustache parties are so popular nowadays. I think all boy’s birthday parties I have attended so far this year with my kids had a mustache theme. Maybe because it’s really simple and easy. Nice party. The food looks mouthwatering, too! Yum! It took me a bit, but it finally made it! Hello! I love the pint mustache glasses. Where did you get then from? We made them! We bought pint glasses and cut vinyl to stick to them. They are so fun, they’re my favorite glasses in the kitchen.